The short version: As far as I can tell, the only place to find it is at Rocket Fizz, which has a store in downtown Vista, near the Cinepolis theater. The long version: My two intrepid Assistant Tasters have decided to celebrate our arrival at a particular point in the Earth's orbit by hosting a party for their friends at the Lab. Some of these friends were previously introduced to a delightful Weird soda, Flying Cauldron Butterscotch Beer, which we reviewed at the Lab back in 2012. Shortly before the party*, I was informed that these splendid young people were hoping that more Flying Cauldron would be provided**. 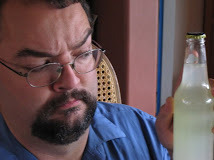 Being a Quaffmaster (even if semi-retired), I assumed that locating a specific Weird soda would not be difficult. I turned to our modern Delphic oracle***, the Google. The Google reported that several stores indicated that their store was familiar with Flying Cauldron, a word which here means "have heard of it at one point, and are pretty sure they'd be able to order it for you with two weeks lead time". It turns out needing it in 24 hours makes businesses feel perfectly entitled to add all sorts of extra charges amounting to it being cheaper to have my own Flying Cauldron brewing facility constructed. The manufacturer's web site is well-constructed, and even has the ability to select a specific beverage and have stores selling that beverage located. How lovely. Of course you can buy Flying Cauldron in your area!, I was told. There are any number of stores, all of the "Fresh & Easy" chain, which stock Flying Cauldron. Here are all the locations within 100 miles of you. Unfortunately, I happen to know that the entire Fresh and Easy chain has recently gone out of business****. Having concluded that my quest was in vain, I resigned myself to provide some sort of lesser butterscotch beverage and throw myself upon the mercy***** of the teenagers who would be descending on the Lab in six hours. According to Rocket Fizz's website, they did not have Flying Cauldron, but did have at least one other butterscotch soda, which might be adequate, so I went there first (the second try would be Cost Plus, where they apparently had Dang! That's Good butterscotch root beer; not my favorite). Browsing through Rocket Fizz, I was astonished to come across Flying Cauldron. Grabbing twelve bottles and snarling ferally at any other customers who wandered near, I went up to the counter. "Do you realize you are the *only* people in North County who stock this?" The proprietor gazed at me, a satisfied smile on his face, a calm serenity in his eyes. "Oh, yes," he replied, "yes, we do." Deep quaffing awaits those who toil. The Butterscotch Beer is on fleek yet! You'll find it at Rocket Fizz. * And by "shortly", I mean "less than 48 hours"
** And by "hoping", I mean "operating under the assumption, with unspecified but dire consequences if said assumption proved unfounded"
*** Having the option to have Google deliver search results in cryptic Delphic utterances is a very very good idea. **** I blame ISIL, and their well-known hatred of butterscotch. ***** I thought I'd give all the parents of teenagers out there a bit of a chuckle to start the New Year. It's been a quiet...er...well, a bit over a year at the Lab. In fact, I haven't been in the Lab. I had moved on to other experiences. Archery. Hang-gliding. Applying to be an academic dean. Competitive marshmallow eating. Shooting marshmallows off of the dean's head with arrows while hang gliding. * My life had expanded to new horizons, and if I thought on the Lab, it was only in dreams. I'd walk across the kitchen, and my eyes would pass over the bench and the spaces beneath, where we kept the Weirdness** in days gone by, and my mind would simply edit it out. I'm not sure whether it was trying to console me or protect me. There are some places where the human mind--or taste buds and olfactory organs--goes, and if it is lucky enough to return unbroken and unscorched, it walls up those memories like Fortunato*** and tries to ignore the faint scratchings in the night. It was at Olorin's Halloween party. An old friend of his had come down to visit us (the friend now lives hundreds of miles north) for the party. As the soiree drew to a close, this young friend's father came to the door to whisk his child away. They were just on their way out, when he turned to me. To my dying day, I'll never know if it was a hallucination, a premonition, or the pure truth, but I saw an unholy light in that man's eyes as his eyes met mine. His mouth curved in a smile whose contours approximated the Dho-Nha geometry needed for the summoning of things which should not be dwelt upon overlong. "So, I heard you're into Weird sodas?" You may have read the title of this post and thought that you were on the wrong blog****. Or perhaps that you have witnessed the world's most unlikely typo*****. Or an autocorrect which says more than one wants to hear about the normal typing of the author. But no...in fact, the can that man handed me on that Halloween night bears the label "Chicken Partner". And a subtitle which...and I would not have believed this was possible...is even Weirder. I really sort of wish I had seen this on a shelf. I can imagine the double take, and the slow walk back to confirm that I had, in fact, seen what I thought I had seen. I think it can smell fear. For what it's worth, I tried using Google Translate to interpret the characters on the front of the can. The website allows one to hand-draw Chinese characters and will suggest likely matches. I did my best, but I have to assume that I did something wrong, because the first two characters come out as "Chicken Clamp". On the other hand, the last two do seem to mean "Partner". The small characters below, according to Google, mean "You Need A Partner". Truly, the mind boggles. Apparently, not only do I need this chicken partner, but said partner identifies as female. Why do I need her? Is she the partner of a chicken? Will the chicken be jealous? Or is the thing I need a female chicken, and I need her *as* a partner? Is this the beginning of a madcap police comedy sitcom, in which a tough-as-nails-but-secretly-warmhearted chicken police officer is partnered with a lovable-but-bumbling-but-secretly-competent physiology professor to fight crimes and learn valuable lessons about the meaning of friendship? I suppose "Chicken Partner" could even be the name of a boat or ship or aircraft of some sort, which I will require at some point in the future. A sequel to "Blue Thunder", perhaps? I'm not even sure that I can speculate. This may be one of those things which really cannot be explained in terms suitable for the sane mind. It's even possible that this is actual nonsense. It could be a Diceware password. But it is definitely...unquestionably...Weird. Really, I think we can only make one guess about this soda before quaffing it. It probably goes well with chicken. Where and when: I don't even want to speculate, but possibly Petaluma, and sometime shortly before Halloween 2015. Color: light to medium amber. The color of a dark ginger ale, such as Vernon's. Scent: Not very sweet, a bit smoky or dusty. Pretty faint. Taste: Um...whoa. Okay, where to begin. First, it's sweet...but the sweet is accompanied by a very strange flavor that I'm having trouble describing. It's bitter and acrid...makes me think of the smell of car tires. The sweet is fairly strong, but the slightly acidic bitter taste is hovering around the sides of my tongue. After about ten seconds, it develops a vaguely alcoholic, volatile, sickly-sweet flavor right around the top of my mouth. This persists as the bitter fades, leaving me with a slight sense of some sort of sweet menthol-ish oil coating the inside of my nose. It's probably safe to say that it's not my favorite. I'm really not quite sure what to liken it to. It's a tiny bit like a cola, I guess, but with a more cloying and less tart taste. It's got a little in common with the Abbondio Chinotto. Actually, it's a tiny bit like Moxie, which I'm also not especially fond of. Kibbitzer-in-Chief: "I think it smells like apple juice that someone's crushed Tylenol into." *grimaces* *grimaces again, but differently* "That's interesting. It...tastes better than it smells. Is that--barbecue sauce?" *grimaces* "Barbecue sauce. Like fake smoke, cider vinegar, brown sugar, and...I don't know. Tastes like cheap barbecue sauce, but carbonated...which *is* better than it smells, but not good." "Oh God, it's still in my nose. Make it go!" Okay, so far this tastes like car tires and cheap barbecue sauce, and it somehow moves into your nose and won't go away. I think our junior tasters need to try it. Nazgul: *sniff* "That's a weird smell." *taste* *long pause, thoughtful expression* "What is it?" Nazgul: *pause* "I'm not sure how I feel about that." Olorin: *sniff* "That's a weird smell." *taste* "It's...actually good. Sweet." Me: "You're welcome to finish it." Me, to Kibbitzer-in-Chief: "Would it go well with chicken?" K-i-C: "I like barbecue chicken." Olorin's friend and his friend's father didn't have names by which I could identify them here, so they'll have to remain anonymous. Unless, of course, I assign them pseudonyms. So thanks much for this truly Weird experience, Bikeronaut and Zombunny! Quaff rating: 1.0. I really can't say I enjoyed it, but I'm pretty unlikely to forget it. Cough rating: 2.0. Barbecued. Car. Tires. * One of these is even true. ** I think that at this point the Weirdness would have to be said to live primarily in Nazgul's room. *** If I even found a can of soda labeled "Amontillado", you know I'd have to review it. "Sweet, just a bit spicy...and gritty, as if with brick dust..."
****I'm not sure on what sort of blog "Chicken Partner" *would* be an unremarkable post title...some sort of exotic folk-dancing blog, perhaps? Or...well, perhaps it's best not to speculate. *****"Ah, I see. He meant to type 'McBlatherson's Cherry Spice Tonic Slime', but it came out 'Chicken Partner'. A mistake anyone could make."